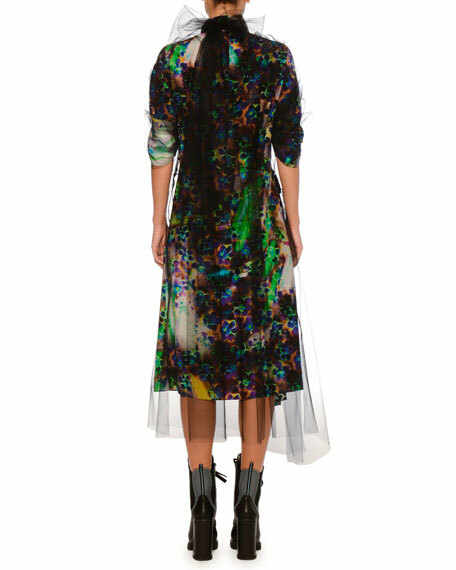 Prada dress in liquid daisy print with asymmetric overlay. 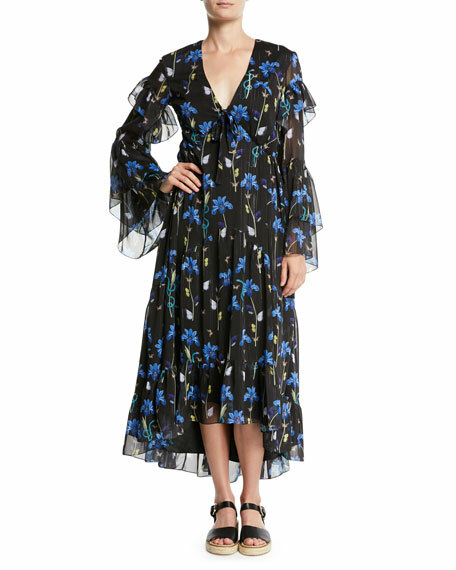 Alice + Olivia "Diana" satin cocktail dress with ruched side. V neckline. Sleeveless. Column silhouette. Thigh-high split. Exposed back zip. Maxi length. Triacetate/polyester. Polyester/spandex lining. Imported. 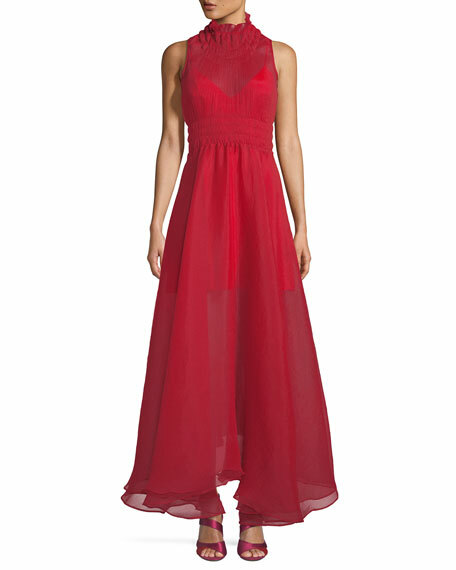 Beaufille "Venus" textured chiffon dress. Cinched elastic stitching at neck & waist. High neckline. Sleeveless. Full A-line skirt. Ruffled hem. Nylon/silk. Lining, polyester. Imported of Italian materials. 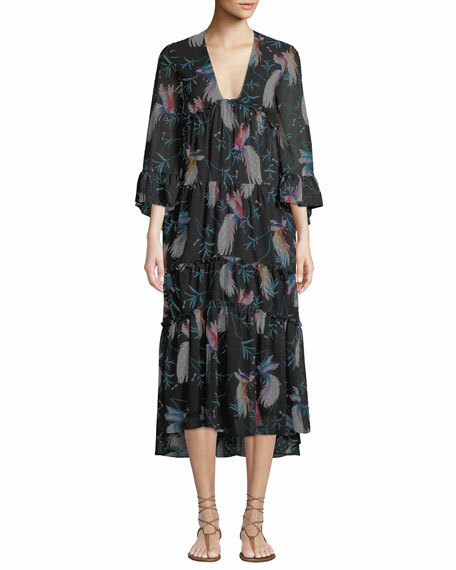 Borgo de Nor bird-print chiffon dress with ruffled trim. V neckline. 3/4 sleeves; flounce cuffs. Tiered A-line silhouette. Hidden back zip. Midi length. High-low hem. Polyester, self & lining. Made in UK. 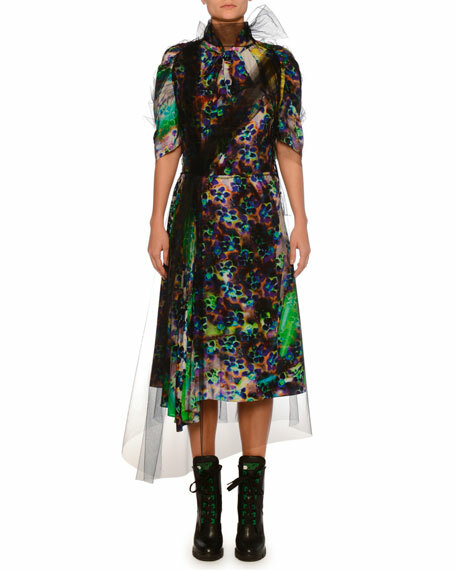 Borgo de Nor dress with butterfly and iris print. V neckline with ties. Long, tiered sleeves. Empire waist. A-line silhouette. Hidden back zip. High-low hem. Maxi length. Polyester, self & lining. Made in UK.